There are many so called holy places in the world. They are those places where, somehow, the veil between our mortal world and the spiritual world seems more fragile. Some people call then ‘touching places’, or ‘thin places’ – places, that is, where one seems to be able to reach out and almost touch the out-stretched hand of God. According to the Hebrew scriptures (or the Old Testament as Christians call it), Bethel was one such place. After his prophetic dream, Jacob called the place ‘House of God’ (which is what Beth-el means. (El was one of the early names for God). For many generations, it was one of Israel’s holiest shrines. The Ark of the Covenant was kept there, until it was transferred to Jerusalem. Prophets and leaders would go to Bethel, to seek God’s wisdom and instruction. Ironically, though, for such a holy place, no-one can say with certainty today where Bethel actually was. Attributions of holiness have been given to many places over the millennia. Stonehenge was once considered holy by its builders – as far as we know. Great cathedrals and churches were considered holy, thin places, because they often contained the bones of great saints. For devotees of our patron Saint, Faith of Agen, the abbey-church of Conques, France is one such place. There are laid the bones of the young martyr – cruelly murdered under the rule of the Roman emperor Diocletian, because she refused to renounce her faith in Jesus Christ. Ask Bishop John and Janet Hind for their account of the place – for they visited it only a few months ago. Where is your ‘thin place’? Where is that you find that the veil between the physical and spiritual worlds is somehow made thinner? For some, it may be a beautiful landscape – the top of a great hill, perhaps. For others, it will often be a place, like this building, in which hundreds of years of prayer and worship have somehow soaked into the stones. Holy places, then, are integral to human faith. Ask a Muslim how he or she feels about Mecca. Ask a Catholic how they feel about St Peter’s in Rome. And yet there is a danger, isn’t there, in investing all our energy into buildings. Anyone who has toured the ruins of great abbey churches around the UK, or sought in vain for the actual site of Bethel, or who has seen the ruins of the Jerusalem Temple should know that faith is not kept alive by holy places alone. They, like all physical things, must pass. In fact, if we are honest, holy buildings can sometimes get in the way. In the temple of Jerusalem, for example, human priests created a holy of holies – a place in which God was said to actually dwell. It was a place so holy, that the High Priest could only go into it on one day of the year, after elaborate rites of purification. The New Testament tells us that the curtain of that ‘holy of holies’ was torn down at the death of Jesus. It was not a helpful picture of God. It had to go. Now (as the book of Revelation has it), God’s dwelling place was with people – not locked up in a back corner of a temple. In fact, you and I are now where God dwells…not in buildings of stone, but in living flesh and blood. Even our own beautiful building has some challenges – in terms of the story it tells about God. For example, the way that the whole focus of the church is fixed on the High Altar, could suggest that God is distant from us….that he is far away, and only to be approached on bended knee, in front of a Sanctuary that ordinary people dare not enter. That is not, I think, the picture of God that Jesus offers us. He wanted us to understand God as our heavenly parent – the father who cares for his children and who walks alongside us. Jesus taught us to expect to find God’s spirit along us, leading us into all truth, dwelling within us. These are not images of a distant God. A church which has its altar in the centre of the people might well be a much more accurate picture. Some of our images of Jesus – in this beautiful building – are rather problematic. The blond, bearded man on the cross in our East Window looks nothing like the probably clean-shaven, dark-haired Jewish man who died for us. What picture of God does this building convey? It’s a picture of God as an Englishman – a blond one at that! That kind of image undermines all that Jesus and his followers taught us about being one family of humankind, in which there is neither Jew nor Greek, black nor white. And yet, as those who steward and care-for this church throughout the week will testify, the building has immense value to all those who enter its doors throughout the week, seeking solace, peace, or a place to seek God. That is why, for all its theological confusion, I think that our continuing efforts to refurbish this place are worthwhile. Its very age and architectural idiosyncrasies are precisely what draw in those seekers of a thin place, a touching place. But at the same time, we must not forget that this building is not ‘the Church’. It is only a shell…at the end of the day, a shelter from the rain in which the actual church can gather. Fundamentally it is now difference from the church of St Nicholas in the parish of Nswam, Ghana – which I visited in 2015. A few palm branches, spread over a frame. Just a shelter from the elements. For, as St Peter says, we are “living stones…built into a spiritual house, to be a holy priesthood”. We are the church – not these stones. We could – if the Diocese would let us! – tear this whole place down – leaving a pile of rubble in the middle of Havant. That would not mean that the church was gone. The people who make up the church would still be here (if a little damp, when it rains!). And that is why we are now beginning to turn our eyes towards the vital question of our Spiritual health as a congregation. For if we are to be strong living stones, capable of being built into the true house of God – a living house of holy priests of God – then we must focus on our own spiritual development. In just over a week’s time, I will be presenting to the PCC a draft Spiritual Development Plan – a plan for ensuring that every one of the living stones of this church has the chance to grow in confidence and faith. So please pray for your PCC, as they ponder the work of the various groups who developed our plan over the last six months. Pray for them as they seek to hear God’s voice, calling us on beyond restoration of paint and plaster (as necessary as that has been) and into the building-up of a holy house of spiritual people, with heaven in their hearts, and the needs of the world on their mind. 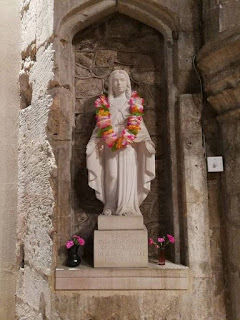 People with so much faith, that they too, if ever called upon, might also demonstrate the certainty of purpose and belief of our own patron, St Faith of Agen. A priest in the Church of England... currently Rector of Havant, Hampshire, in the UK. Also Honorary Canon to two Cathedrals in Ghana, Cape Coast and Ho (Volta Region).